Dr. Stephan C. Schürer joined the Center for Computational Science in October 2008 leading the cheminformatics (Computational Chemistry) program. He is Research Assistant Professor at the Department of Molecular and Cellular Pharmacology at the Miller School of Medicine and Adjunct Assistant Professor at the Department of Molecular Therapeutics at the Scripps Research Institute in Florida. His research is centered in computer-aided drug design, cheminformatics, translational drug informatics, and semantic integration with the goal to better synergize experimental and ‘in-silico’ approaches for the development of small molecule tool compounds and drug “leads”. His laboratory develops and applies computational compound and protein target profiling for drug discovery, new ontologies and software for integration and analysis of diverse screening data sets, and cheminformatics infrastructure for large scale data analysis. Dr. Schürer is also interested in developing novel cheminformatics approaches to address synthetic feasibility and synthetically accessible chemical space. The work of Stephan Schürer, Ph.D., and Vance Lemmon, Ph.D., powered by a federal stimulus grant, enables scientists to access and analyze complex biological datasets in just minutes. 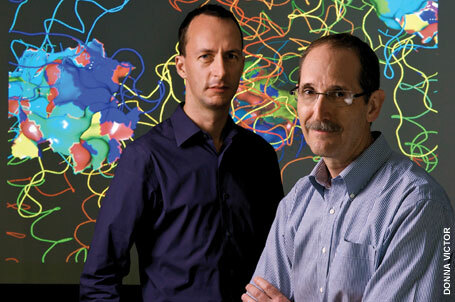 In his previous position at the Scripps Research Institute Florida, Dr. Schürer led the cheminformatics activities to develop an integrated screening and drug discovery informatics infrastructure, which is now routinely used to process and analyze large data sets from high-throughput screening and drug discovery projects. Dr. Schürer led the cheminformatics efforts at the Scripps Research Molecular Screening Center and the Columbia University Screening Center and was also chairman of the Informatics Working Group of the National Molecular Libraries Screening Centers Network. Prior to joining Scripps, Dr. Schürer was Sr. Director at Eidogen-Sertanty, a developer of cheminformatics technology and scientific content products. In previous positions at Sertanty and Libraria, Inc., he was responsible for the development of chemistry and SAR knowledge bases, and headed the off-shore content operations. Various private and government-funded research and development projects yielded commercial products that are now licensed to major pharmaceuticals and biotechnology companies. Dr. Schürer received his Ph.D. in synthetic organic chemistry from the Technical University of Berlin (Technische Universität Berlin). He studied chemistry at Humboldt University-Berlin (Humboldt-Universität zu Berlin), Max-Planck Institute for Biophysical Chemistry-Göttingen, and the University of California, Berkeley. Sarntivijai, S.; Lin, Y.; Xiang, Z.; Meehan, T.F. ; Diehl, A.D.; Vempati, U.D. ; Schürer, S.C.; Pang, C.; Malone, J.; Parkinson, H.; Liu, Y.; Takatsuki, T.; Saijo, K.; Masuya, H.; Nakamura, Y.; Brush, M.; Haendel, M.A. ; Zheng, J.; Stoeckert, C.J. ; Peters, B.; Mungall, C.J. ; Carey, T.E. ; States, D.J. ; Athey, B.D. ; He, Y. “CLO: The Cell Line Ontology” J Biomed Semantics, 2013, accepted for publication. Przydzial, M.J.; Bhhatarai, B.; Koleti, A.; Vempati, U.; Schürer, S.C. “GPCR ontology: development and application of a G protein-coupled receptor pharmacology knowledge framework” Bioinformatics, 2013, in press, doi:10.1093/bioinformatics/btt565. Satsu, H.; Schaeffer, M.T. ; Guerrero, M.; Saldana, A.; Eberhart, C.; Hodder, P.; Cayanan, C.; Schürer, S.; Bhhatarai, B.; Roberts, E.; Rosen, H.; Brown, S.J. “A sphingosine 1-phosphate receptor 2 selective allosteric agonist” Bioorg. Med. Chem. 2013, 5373-82, doi:10.1016/j.bmc.2013.06.012, http://www.sciencedirect.com/science/article/pii/S0968089613005439. Bibian, M.; Rahaim, R.J.; Choi, J.Y. ; Noguchi, Y.; Schürer, S.; Chen, W.; Nakanishi, S.; Licht, K.; Rosenberg, L.H. ; Li, L.; Feng, Y.; Cameron, M.D. ; Duckett, D.R. ; Cleveland, L.L. ; Roush, W.R. “Development of highly selective casein kinase 1δ/1ε (CK1δ/ε) inhibitors with potent antiproliferative properties” Bioorg. Med. Chem. Lett. 2013, 4374-80, doi:10.1016/j.bmcl.2013.05.075, http://www.sciencedirect.com/science/article/pii/S0960894X13006707. Al-Ali, H.; Schürer, S.C.; Lemmon, V.P. ; Bixby, J.L. “Chemical Interrogation of the Neuronal Kinome Using a Primary Cell-Based Screening Assay.” ACS Chem Biol, 2013, doi:10.1021/cb300584e, http://pubs.acs.org/doi/abs/10.1021/cb300584e. Wolfe, L.M. ; Veeraraghavan, U.; Idicula-Thomas, S.; Schurer, S.; Wennerberg, K.; Reynolds, R.; Besra, G.S. ; Dobos, K.M. “A Chemical Proteomics Approach to Profiling the ATP-Binding Proteome of Mycobacterium tuberculosis.” Mol Cell Proteomics, 2013, doi:10.1074/mcp.M112.025635; http://www.mcponline.org/content/early/2013/03/05/mcp.M112.025635.long. Schürer, S.C., Muskal, S.M. “Kinome-wide Activity Modeling from Diverse Public High-Quality Data Sets” J Chem Inf Model, 2013, doi:10.1021/ci300403k; http://pubs.acs.org/doi/abs/10.1021/ci300403k. Vidović, D.; Muskal, S.M. ; Schürer S.C. “Novel Kinase Inhibitors by Reshuffling Ligand Functionalities Across the Human Kinome” J Chem Inf Model, 2012, 3107–3115, doi:10.1021/ci3003842; http://pubs.acs.org/doi/abs/10.1021/ci3003842. Jo, E.; Bhhatarai, B.; Repetto, E.; Guerrero, M.; Riley, S.; Brown, S.J. ; Kohno, Y.; Roberts, E.; Schürer, S.C.; Rosen, H. “Novel Selective Allosteric and Bitopic Ligands for the S1P(3) Receptor” ACS Chem Biol 2012, doi:10.1021/cb300392z; http://pubs.acs.org/doi/abs/10.1021/cb300392z. Vempati, U.D. ; Przydzial, M.J.; Chung, C.; Abeyruwan, S.; Mir, A.; Sakurai, K.; Visser, U.; Lemmon, V.P. ; Schürer, S.C. “Formalization, Annotation and Analysis of Diverse Drug and Probe Screening Assay Datasets using the BioAssay Ontology (BAO).” PLoS One, 2012, doi:10.1371/journal.pone.0049198. Ganesan, L.; Vidovic, D.; Schürer, S.C.; Buchwald, P. “Exploratory computational assessment of possible binding modes for small molecule inhibitors of the CD40-CD154 co-stimulatory interaction” Pharmazie 2012, 67, 1-6, doi: 10.1691/ph.2012.1696. Chowdhury, S., Hampton Sessions, E., Pocas, J. R., Grant, W., Schröter, T., Lin, L., Ruiz, C., Cameron, M.D., Schürer, S., LoGrasso, P., Bannister, T.D., and Feng, Y. “Discovery and optimization of indoles and 7-azaindoles as Rho kinase (ROCK) inhibitors (Part-I)”, Bioorg. Med. Chem. Lett. 2011, 21, 7107-12. Bialkowska, A.; Crisp, M.; Bannister, T.; He, Y.; Chowdhury, S.; Schürer, S.; Chase, P.; Spicer, T.; Madoux, F.; Tian, C.; Hodder, P.; Zaharevitz, D.; Yang, V.W. “Identification of Small-Molecule Inhibitors of the Colorectal Cancer Oncogene Krüppel-Like Factor 5 Expression by Ultrahigh-Throughput Screening” Mol. Cancer. Ther. 2011, doi: 10.1158/1535-7163. Vidović, D.; Xie, Y.; Rinderspacher, A.; Deng, S.X. ; Landry, D.L. ; Chung, C.; Smith, D.H.; Tautz, L.; Schürer, S.C. “Distinct Functional and Conformational States of the Human Lymphoid Tyrosine Phosphatase Catalytic Domain can be Targeted by Choice of the Inhibitor Chemotype”, J. Comp. Aid. Mol. Des., 2011, 873-83, doi:10.1007/s10822-011-9469-2. Maiguel, D.; Hafeez, F.M. ; Wei, C.; Kuwano, Y.; Balla, K.; Hernandez, D.; Barth, C.J. ; Lugo, G.; Donnelly, M.; Nayer, A.; Moita, L.F.; Schürer, S.; Traver, D.; Ruiz, P.; Vazquez-Padron, R.I.; Ley, K.; Reiser, J,; Gupta, V. “Small molecule mediated activation of integrin CD11b/CD18 reduces inflammatory disease.” 2011, Science Signaling, accepted for publication. Visser, U.; Abeyruwan, S.; Vempati, U.; Smith, R.; Lemmon, V.; Schürer, S.C. “BioAssay Ontology (BAO): A Semantic Description of Bioassays and High-Throughput Screening Results”, BMC Bioinformatics, 2011, 12, doi:10.1186/1471-2105-12-257. Choi, J.H. ; Banks, A.; Kamenecka, T.; Busby, S.; Chalmers, M.; Kumar, N.; Kuru, D.; Shin, Y.; He, Y.; Bruning, J.; Marciano, D.; Cameron, M.; Laznik, D.; Jurczak, M.; Schürer, S.; Vidović, D.; Shulman, G.; Griffin, P.; Spiegelman, B. “Potent Anti-Diabetic Actions of a Non-Agonist PPARγ Ligand that Blocks Cdk5-Mediated Phosphorylation”, Nature, 2011, accepted for publication. Sarntivijai, S.; Xiang, Z.; Meehan, T.F. ; Diehl, A.D.; Vempati, U.; Schurer, S.; Pang, C.; Malone, J.; Parkinson, H.; Athey, B.D. ; He, Y. “Cell Line Ontology: Redesigning Cell Line Knowledgebase to Aid Integrative Translational Informatics” Proceedings of the International Conference on Biomedical Ontology (ICBO), 2011, in press. Barman, A.; Schürer, S.; Prabhakar, R. “Computational Modeling of Substrate Specificity and Catalysis of the ß-Secretase (BACE1) Enzyme” Biochemistry, 2011, 50 (20), 4337-4349. Solt, L.A.; Kumar, N.; Nuhant, P.; Wang, Y.; Lauer, J.L. ; Liu, J. Istrate, M.A. ; Kamenecka, T.M. ; Roush, W.R.; Vidović, D.; Schürer, S.C.; Xu, J.; Wagoner, G.; Drew, P.D. ; Griffin, P.R. ; Burris. T.P. “Suppression of TH17 differentiation and autoimmunity by a synthetic ROR ligand” Nature, 2011, 472, 491–494. Bachovchin, D.A. ; Mohr, J.T. ; Speers, A.E. ; Wang, C.; Berlin, J.M. ; Spicer, T.P. ; Fernandez-Vega, V.; Chase, P.; Hodder, P.S. ; Schürer, S.C.; Nomura, D.K. ; Rosen, H.; Fu, G.C. ; Cravatt, B.F. “Organic Synthesis Toward Small-Molecule Probes and Drugs Special Feature: Academic cross-fertilization by public screening yields a remarkable class of protein phosphatase methylesterase-1 inhibitors” Proc Natl Acad Sci U S A, 2011, 6811-6. Schürer, S.C.; Vempati, U.; Smith, R.; Southern, W.; Lemmon, V. “BioAssay Ontology Annotations Facilitate Cross-Analysis of Diverse High-throughput Screening Data Sets” J Biomol Screen, 2011, 415-26. Vidović, D.; Busby, S.A.; Griffin, P.R. ; Schürer, S.C. “Combined Ligand- and Structure-based Virtual Screening Protocol Identifies Novel Submicromolar PPARγ Partial Agonists” ChemMedChem 2011, 2011, 6(1), 94-103. Vang, T.; Xie, Y.; Liu, W.H. ; Vidović, D.; Liu, Y.; Wu, S,; Smith, D.H.; Rinderspacher, A.; Chung, C.; Gong, G.; Mustelin, T.; Landry, D.W.; Rickert, R.C. ; Schürer, S.C.; Deng, S.X. ; Tautz, L. “Inhibition of Lymphoid Tyrosine Phosphatase by Benzofuran Salicylic Acids.” J. Med. Chem. 2011, 54, 562-71. Fang, X.; Yin, Y.; Chen Y.T. ; Yao, L.; Wang, B.; Cameron, M.D. ; Lin, L.; Khan, S.; Ruiz, C.; Schröter, T.; Grant, W.; Weiser, A.; Pocas, J.; Pachori, A; Schürer, S.C.; LoGrasso, P.; Feng, Y. “Tetrahydroisoquinoline Derivatives As Highly Selective and Potent Rho Kinase Inhibitors” J. Med. Chem. 2010, 5727-37. Abeyruwan, S.; Visser, U.; Lemmon, V.; Schürer, S. “PrOntoLearn: Unsupervised Lexico-Semantic Ontology Generation using Probabilistic Methods.” Proceedings of the 6th International Workshop on Uncertainty Reasoning for the Semantic Web (URSW 2010), CEUR Workshop Proceedings 2010, 654, 25-36. Abeyruwan, S.; Chung, C.; Datar, N.; Gayanilo, F.; Koleti, A.; Lemmon, V.; Mader, C.; Ogihara, M.; Puram, D.; Sakurai, K.; Smith, R.; Vempati, U.; Venkatapuram, S.; Visser, U.; Schürer, S. “A Semantic Web Application for Biological Screening and Drug Discovery Research” Semantic Web Challenge, 9th International Semantic Web Conference (ISWC), Shanghai, China, 2010. Yin, Y.; Cameron, M.D. ; Lin, L.; Khan,S. ; Schröter, T. Grant, W.; Pocas, J.; Chen, J.T. ; Schürer, S.; Pachori, A.; LoGrasso, P.; Feng, Y. “Discovery of Potent and Selective Urea-Based ROCK Inhibitors and Their Effects on Intraocular Pressure in Rats” ACS Med. Chem. Lett. 2010, 1(4), 175-9. Faridi M.H., Maiguel D., Brown B.T., Suyama E., Barth C.J., Hedrick M., Vasile S., Sergienko E., Schürer S., Gupta V. “High-throughput screening based identification of small molecule antagonists of integrin CD11b/CD18 ligand binding” Biochem Biophys Res Commun 2010, 394(1),194-9. Schürer, S.; Sharma, R.; Muskal, S.M. “Kinome-wide comparison of small molecule activity predictors from diverse high-quality data” CICSJ Bulletin 2009, 27, 87-92. Faridi, M.H. ; Maiguel, D.; Barth, C.J. ; Stoub, D.; Day, R.; Schürer, S; Gupta, V. “Identification of novel agonists of the integrin CD11b/CD18.” Bioorg. Med. Chem. Lett. 2009, 6902-6. Vidović, D., Schürer, S.C. “Knowledge-based Characterization of Similarity Relationships in the Human ProteinTyrosine Phosphatase Family for Rational Inhibitor Design” J. Med. Chem. 2009, 6649-59. Yin, Y.; Lin, L.; Ruiz, C.; Cameron, M.D. ; Pocas, J.; Grant, W.; Schröter, T.; Chen, W.; Duckett, D.; Schürer, S.C.; LoGrasso, P.; Feng, Y. “Benzothiazoles as Rho-associated kinase (ROCK-II) inhibitors” Bioorg. Med. Chem. Lett. 2009, 6686-90. Xie Y.; Liu Y.; Gong, G.; Smith, D. H.; Yan, F.; Rinderspacher A.; Feng, Y.; Zhu, X.; Li, X.; Deng, S.-X., Branden L.; Vidović D.; Chung C.; Schürer S.; Morisseau, C.; Hammock, B.D. ; Landry D. W. “Discovery of Potent Non-urea Inhibitors of Soluble Epoxide Hydrolase” Bioorg. Med. Chem. Lett. 2009, 2354-59. Rinderspacher A.; Cremona, M.L. ; Liu Y.; Deng, S.-X., Xie Y.; Gong, G.; Aulner, N.; Többen, U.; Myers, K.; Chung C.; Andersen, M.; Vidović D.; Schürer S.; Branden L.; Yamamoto, A.; Landry D. W. “Potent inhibitors of Huntingtin protein aggregation in a cell-based assay” Bioorg. Med. Chem. Lett. 2009, 1715-17. Feng, Y.; Yin, Y.; Weiser, A.; Griffin, E.; Cameron, M.D. ; Lin, L.; Ruiz, C.; Schürer, S.C.; Inoue, T.; Rao, P. V.; Schröter, T.; LoGrasso, P. “Discovery of Substituted 4-(Pyrazol-4-yl)-phenylbenzodioxane-2-carboxamides as Potent and Highly Selective Rho Kinase (ROCK-II) Inhibitors” J. Med. Chem. 2008, 51, 6642-45. Chen, Y.T. ; Bannister, T.D. ; Weiser, A.; Griffin, E.; Lin, L.; Ruiz, C.; Cameron, M. D.; Schürer, S.C.; Duckett, D.; Schröter, T.; LoGrasso, P.; Feng, Y. “Chroman-3-amides as potent Rho kinase inhibitors” Bioorg. Med. Chem. Lett. 2008, 6406-9. Sessions, E.H.; Yin, Y.; Bannister, T.D. ; Weiser, A.; Griffin, E.; Pocas, J.; Cameron, M.D. ; Ruiz, C.; Lin, L.; Schürer, S.C.; Schröter, T.; LoGrasso, P.; Feng, Y. “Benzimidazole- and benzoxazole-based inhibitors of Rho kinase” Bioorg. Med. Chem. Lett. 2008, 6390-3. Schürer, S.C.; Brown, S. J.; Cabrera, P.G. ; Schaeffer, M.-T.; Chapman, J.; Chase, P.; Spicer, T.; Hodder, P.; Rosen, H. “Ligand-binding pocket shape differences between S1P1 and S1P3 determine efficiency of chemical probe identification by uHTS” ACS Chem. Biol. 2008, 3, 486-98. Guha, R.; Schürer, S.C. “Utilizing High Throughput Screening Data for Predictive Toxicology Models: Protocols and Application to MLSCN Assays” J. Comput.-Aid. Mol. Des., 2008, 22, 367-84. Xie Y.; Liu Y.; Gong, G.; Rinderspacher A.; Deng, S.X. ; Smith, D.H.; Toebben, U.; Tzilianos, E.; Branden, L.; Vidović D.; Chung, C.; Schürer, S.; Tautz, L.; Landry, D.W. “Discovery of a novel submicromolar inhibitor of the lymphoid specific tyrosine phosphatase” Bioorg. Med. Chem. Lett. 2008, 18, 2840-4. Xie, Y.; Deng, S.; Thomas, C. J.; Liu, Y. ; Rinderspacher, K. A.; Gong, G.; Wyler, M.; Cayanis, E.; Aulner, N.; Toebben, U.; Chung, C.; Pompou, S.; Vidovic, D.; Schürer, S.; Mayer, T.; Branden, L.; Zhang, Y.-Q. ; Davis, R. E.; Southall, N.; Huang, W.; Staudt, L. M.; Austin, C. P.; Inglese, J.; Landry, D.; Smith, D.; Auld. D. S. “Identification of N-(quinolin-8-yl)benzenesulfonamides as Agents Capable of Down-Regulating NFκB Activity within Two Separate High-Throughput” Bioorg. Med. Chem. Lett. 2008, 18, 329-35. Schröter, T.; Minond, D.; Weiser, A; Dao, C.; Habel, J.; Spicer, T.; Chase, P; Baillargeon, P.; Scampavia, L; Schürer, S.; Chung, C.; Mader, C.; Southern, M.; Tsinoremas, N.; LoGrasso, P.; Hodder, P. “Comparison of Miniaturized Time-Resolved Fluorescence Resonance Energy Transfer and Enzyme-Coupled Luciferase High-Throughput Screening Assays to Discover Inhibitors of Rho-Kinase II (ROCK-II).” J. Biomol. Screen., 2008, 13, 17-28. Schürer, S. C.; Tyagi, P.; Muskal, S. M. “Prospective exploration of synthetically feasible, medicinally relevant chemical space” J. Chem. Inf. Model. 2005, 45, 239-248. Schürer, S. C.; Gessler, S.; Buschmann, N.; Blechert, S. “Synthesis and Application of a Permanently Immobilized Olefin Metathesis Catalyst” Angew. Chem. 2000, 112, 4062; Angew. Chem. Int. Ed. 2000, 39, 3898. Schürer, S. C.; Blechert, S. “Sequences of Yne-Ene Cross Metathesis and Diels-Alder Cycloaddition Reactions – Modular Solid Phase Synthesis of Substituted Octahydrobenzazepinones” Synlett 1999, 1879. Schürer, S. C.; Blechert, S. “Synthesis of pseudo oligosaccharides by a sequence of yne-ene cross metathesis and Diels-Alder reaction” Chem. Commun. 1999, 1203. Schürer, S. C.; Blechert, S. “A Versatile Synthesis of Substituted Tetrahydropyridines” Tetrahedron Lett. 1999, 40, 1877. Souers, A. J.; Schürer, S. C.; Kwack, H. H.; Virgilio, A. A., Ellman; J. A. “Preparation of Enantioenriched a-Bromo Acids with Diverse Side Chain Functionality” Synthesis 1999, 583. Schürer, S. C.; Blechert, S. “Ruthenium-Catalyzed Yne-Ene Cross Metathesis Binding to Solid Support and Cleavage by Pd0-Catalysis” Synlett 1998, 166. Souers, A. J.; Virgilio, A. A.; Schürer, S. C.; Ellman, J. A.; Kogan, T. P.; West, H. E.; Ankener, W.; Vanderslice, P. “Novel Inhibitors of a4b1 Integrin Receptor Interactions Through Library Synthesis and Screening,” Bioorg. Med. Chem. Lett. 1998, 8, 2297. Virgilio, A. A.; Schürer, S. C.; Ellman, J. A. “Expedient Synthesis of b-Turn Mimetics Incorporating the i+1, i+2, and i+3 Sidechains” Tetrahedron Lett. 1996, 37, 6961. Simanski, S.; Madoux, F.; Rahaim, R.J.; Chase, P.; Schürer S.; Cameron, M.; Mercer, B.A. ; Hodder, P.; Roush, W.R.; Ayad, N.G. “Identification of Small Molecule Inhibitors of Wee1 Degradation and Mitotic Entry” in Probe Reports from the NIH Molecular Libraries Program, U.S. National Library of Medicine, Bethesda (MD); 2013; http://www.ncbi.nlm.nih.gov/books/ NBK143190/. Kamenecka, T.M. ; Busby, S.A.; Kumar, N.; Choi, J.H. ; Banks, A.S.; Vidovic, D.; Cameron, M.D. ; Schürer, S.C.; Mercer, B.A. ; Hodder, P.; Spiegelman, B.M. ; Griffin, P.R. “Potent Anti-Diabetic Actions of a Novel Non-Agonist PPARγ Ligand that Blocks Cdk5-Mediated Phosphorylation” in Probe Reports from the NIH Molecular Libraries Program, U.S. National Library of Medicine, Bethesda (MD); 2013; http://www.ncbi.nlm.nih.gov/books/NBK143191/. Vempati, U.D. ; Schürer, S.C. “Development and Applications of the Bioassay Ontology (BAO) to describe and categorize High-Throughput Assays” in G. S. Sittampalam, J. Weidner, D. Auld, M. Glicksman, M. Arkin, A. Napper, J. Inglese (Eds. ), Assay Guidance Manual, Eli Lilly & Company and the National Center for Advancing Translational Sciences, U.S. National Library of Medicine, Bethesda (MD); 2012; http://www.ncbi.nlm.nih.gov/books/NBK53196/. Williams, A.J. ; Arnold J.G. Nevlon, C.; Spencer, R.; Schürer, S; Ekins, S. “Current and Future Challenges for Collaborative Computational Technologies for the Life Sciences” in Sean Ekins, Maggy A.Z. Hupcey, Anthony J. Williams (Eds.) Collaborative Computational Technologies for Biomedical Research, Wiley and Sons, 2011, pp. 491-518. Mayer, T; Schürer, S. “Compound profiling with high content screening methodology” in Haian Fu (Ed), Chemical Genomics. Cambridge University Press, 2011, pp. 215-224. Schürer, S.C.; Tsinoremas, N.F. “Screening Informatics” in Taosheng Chen (Ed. ), A Practical Guide to Assay Development and High-Throughput Screening in Drug Discovery. Taylor and Francis, 2009, pp. 233-263. Schurer, Stephan C.; Muskal, Steve M.; Tyagi, Prashant; Iha, Sanjiv K. “Separation of Matching and Mapping in Chemical Reaction Transforms” US2003229477, 2003-Dec-11. Schurer, Stephan C.; Bunin, Barry A.; Muskal, Steve M. “Chemistry Resource Database” WO03046799, 2003-Jun-05. Morales, Guillermo A.; Saunders, Oliver L.; Schurer, Stephan C.; Bunin, Barry A.; Muskal, Steve M.; Powers, Timothy S. ”Method of Flexibly Generating Diverse Reaction Chemistries” WO03044219, 2003-May-30. Morales, Guillermo A.; Saunders, Oliver L.; Schurer, Stephan C.; Bunin, Barry A.; Muskal, Steve M.; Powers, Timothy S. ”Method of Flexibly Generating Diverse Reaction Chemistries” US2003087334, 2003-May-08. Schurer, Stephan C.; Bunin, Barry A.; Muskal, Steve M. “Chemistry Resource Database” US2002077757, 2002-Jun-20.